Those of you on the Neighbourhood watch OWL system will have received the following notification a few days ago. (If you are not on the OWL system please go to https://www.owl.co.uk to register). Hertfordshire’s PCC is refreshing his Community Safety and Criminal Justice Plan: Everybody’s Business and wants to hear your views. At the beginning of his second term, Police and Crime Commissioner, David Lloyd, set out his ambition and vision for community safety and criminal justice across the county over the coming years. The Commissioner is starting the process of refreshing his Plan that will lead to a refreshed edition in spring 2019. He is asking for feedback from the public and partners on the current Plan ahead of consulting on a new version over the coming months. What should the PCC’s refreshed Plan continue to focus on over the years ahead? What are the new and emerging issues that should be included in the refreshed Plan? You can also send your comments by Letter to the Police and Crime Commissioner for Hertfordshire, 15 Vaughan Road, Harpenden, Hertfordshire, AL5 4GZ by 10th January, 2019. Welwyn Parish is primarily a rural community, which centres round the village high street and amenities. There are a large number of elderly residents and properties on the outer boundaries are somewhat remote from transport links. The roads are very dark at night and, with the exception of the village centre, quiet. Over the past two or three years there has been a marked increase in petty crime and anti-social behaviour, attributable in many instances to local youths and, on occasion, to travelling community children. For local businesses, there have been issues of shoplifting, nuisance, vandalism and harassment. For residents, there have been issues of nuisance, vandalism (especially to vehicles), harassment, dangerous “wheelie” cycling on footpaths and against traffic, speeding at night on roads, general disturbance. For the elderly this is very frightening. There have also been the usual burglaries and thefts from vehicles. Another issue that concerns residents is the very frequent illegal parking on the zigzags, and on the zebra crossing, outside Tesco in Welwyn Village. This takes place mostly in the evenings between 5:30 and 7:30 pm. Residents appreciate that, in the great order of issues within the Welwyn Hatfield Borough, the above are of lesser importance to the gang, drug, knife and violent crimes that take place in other parts. They also understand that the police must give priority to these above the minor issues. However, two years ago, you promised to increase community policing. Policing in Welwyn Village is minimal. The local PCSO has a vast area to cover; we rarely see him. Policing is, by nature of the limited resources and cuts, reactive as opposed to proactive. Residents still reminisce to the “good old days” 3 years ago, when a local PC was regularly seen in Welwyn and was known by almost everyone. Old fashioned policing it may have been – but it worked. He knew the local youths and communicated with them. We had no noticeable anti-social behaviour, nor any of the issues that have ensued since the “Bobby was taken off the Beat”. It is unlikely that residents would object to an increase in local taxation to cover more PCs and PCSOs, providing there was some evidence of better police support for local communities. The WPAG has responded to the Hertfordshire Police and Crime Commissioner’s invitation to send comments about his Proposals to increase the Council Tax Policing Precept for 2018 . That Response has been published separately. It is recommended that you first understand the background to his Proposals, and you have a choice of going to his official website and reading his Open Letter or reading the letter which members of the Police OWL system (Online Watch Link) received on 22nd January 2018 which provides an excellent summary and which we have copied below for your convenience. I hope that you have had a good start to 2018. Before Christmas I sent a message regarding my proposals for this year’s council tax precept to be spent on policing. The government recently gave Police and Crime Commissioners the flexibility to apply an increase equivalent to £1 a month on the average household to fund local policing. I propose to take advantage of this flexibility and raise the precept by this amount which is £12 a year. Many of you have taken the time to share your views with me on this, for which I am grateful. With just over a week to go before I present my proposal to the Police and Crime panel, I want to give those of you who have not had a chance to share comments another opportunity to do so. In Hertfordshire, this additional funding will be spent on protecting neighbourhood policing teams and investing in additional police officers for Hertfordshire’s specialist Operation Scorpion units to help tackle burglary, anti-social behaviour and drug-related crime. More resources will also be placed into the Force Control Room, where 999 and 101 calls have risen dramatically since the terrorist attacks in Manchester and London. There will also be more funding for crime investigation teams to make sure that victims of crime receive the best care possible. You can read my Open Letter attached to this email, or at the website, where you can also see the press release and FAQs. The meeting held at Welwyn Civic Centre on Wednesday 8th March provided the impressive number of local residents and businesses who attended the opportunity to express their concerns to members of the Police, Fire Service and Borough Council officers. The issues raised were primarily those of public safety and the wish for more visual police presence in the area, particularly at times when incidents are more prevalent. The concerns were duly noted and taken on board. There has been a slight increase of police car patrols through the village and there would appear to have been a corresponding decrease in the kind of anti-social behaviour that was taking place. Please be aware of anything untoward and be sure to report it immediately to 101. As I said last time, we need to keep the police aware of any concerns in the village and, “if it isn’t reported, it didn’t happen” so be sure to pick up the phone! CRIME AND ANTI-SOCIAL BEHAVIOURPetty crime and anti-social behaviour are steadily on the increase and can be witnessed on more or less a daily basis. Local shops are experiencing frequent shoplifting by minors, there have been many incidences of abusive and unpleasant behaviour, particularly affecting the High Street businesses and houses in that area. The latest dangerous craze amongst young boys is riding bicycles on one wheel up the middle of the road into oncoming traffic or pedestrians!The police have been made aware of what is going on. They urge residents to report to 101 each and every incident that takes place, no matter how minor. If it isn’t reported, it didn’t happen!Please note: On WEDNESDAY 8th MARCH, between 14:00 and 16:00, The Community Safety Partnership will be visiting Welwyn. (High Street Car Park, or in the Civic Centre if weather bad). Crime advice, OWL signups and much more. This will be an opportunity to make the police aware of local concerns and it is therefore really important that as many people as possible come to this event.NEIGHBOURHOOD WATCH. One of the most beneficial aspects of living in Welwyn and surrounding areas has been the low crime rate. This is mainly due to the very close-knit community spirit that exists and how people look out for their neighbours. Maintaining this will help to ensure that Welwyn continues to be a safe and delightful place in which to live, and I would ask any residents who have not already done so to sign up to Neighbourhood Watch OWL (Online Watch Link). This will enable you to receive online messages from the police about incidents throughout the Borough, as well as putting you in touch with local co-ordinators for your immediate area. Feel free to contact me for more information. Illegal and inconsiderate parking is an ongoing problem, particularly during rush hour periods and school runs. Vehicles are frequently parked on double yellow lines, on corners, on the pedestrian crossing and zigzags. All of these offences create traffic jams and dangerous situations. The perpetrators are breaking the law. The Police and the Borough Council are equally responsible for enforcement but, due to staff and finance cuts, neither organisation is able to efficiently control the situation on a regular basis.Speeding and driving carelessly through the village are also a matter of concern. Suggestions of a 20mph speed limit on some roads and slow down “smiley face” signs have been suggested by some residents as a possible solution. EA asked their modellers to test the proposed changes in the Singlers Marsh area. These were carried out on an early version of the model therefore the results are precautionary and will be improved with further modelling work. 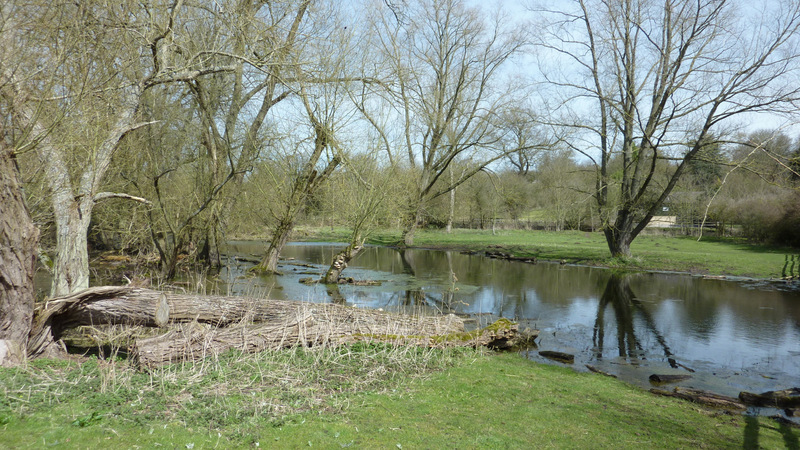 A precautionary approach was also taken with how the interaction between the river and the groundwater was modelled, meaning that the EA approach will overstate the impact. With flood modelling, they think it is always better to over-estimate rather than under-estimate and, with this precautionary approach to modelling, the EA predict that the River Mimram could see a small rise following the sustainability reduction. The EA’s technical experts have reviewed the initial model results and, at this stage, believe that a negligible increase in flood risk is the most likely outcome but cannot prove or rule out a small effect on flood risk. The EA are liaising with Affinity Water to provide an interim operating agreement that would mitigate the possible change in risk and are currently making very positive progress towards this. The WPAG are keeping a close watch on developments; are in regular communication with Welwyn Parish Council and will keep residents notified of any significant information as it becomes available. Defibrillator – News about Training – and an update. Welwyn Village now has an AED (Automatic External Defibrillator) located outside Barclays Bank in Church Street. This is accessible 24/7 without prior training by anyone witnessing a person having a suspected heart attack. It will significantly increase the chance of saving their life before Paramedics arrive. You cannot harm someone in error; if they are not actually in cardiac arrest (heart attack) the AED will not shock them! Many thanks to everyone who supported the fund-raising initiative. In particular we thank the Welwyn Wailers for donating £1,000 from this year’s Wail, and the four village businesses that responded with donations, Mimram Veterinary Centre, Neel Dentistry, Putterills and SuSu. We have arranged for the Community Heartbeat Trust to run an awareness session at 8 – 9.30 pm on Wednesday 28th September in St Mary’s Church House. This is for anyone who would like to know how to recognise someone having a heart attack, how the AED works, how it links with the ambulance service and how to look after the patient until medical help arrives. This session is free of charge and you are very welcome to attend. We almost have funds for a second AED and pending further fund-raising are investigating other locations within the civic parish of Welwyn. If you are able to contribute to this important community asset please contact us for details. Welwyn Village now has an AED (Automatic External Defibrillator) located outside Barclays Bank in Church Street. This is accessible 24/7 to anyone witnessing a person in cardiac arrest (or having a suspected heart attack) and will significantly increase the chance of saving their life before Paramedics arrive. Clearly, despite the designed ease of use, it is important that local people should familiarise themselves where the AED is sited, so that in an emergency they are in a strong position to advise and help visitors to Welwyn’s retail centre. Despite the ease of use of this equipment, extra training will be provided in due course for interested and concerned local people,. Please pass the message on. Tell people where the defibrillator is sited. Tell people to be confident and use it in an emergency. Tell people that they will be given clear instructions. 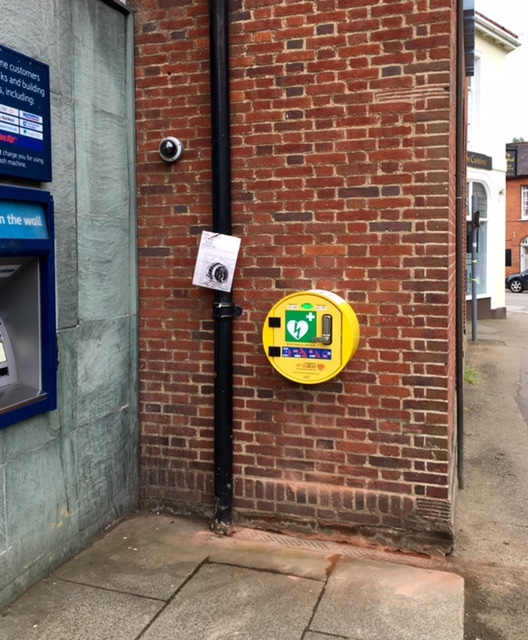 As a result of an initiative and fund raising jointly by St Mary’s Church and the Welwyn Parish Plan Action Group, an AED (Automatic External Defibrillator) has now been installed in Welwyn High Street, and will soon be commissioned into service for the community. The AED is designed to be used by anyone who witnesses someone in cardiac arrest in conjunction with calling 999. Four Welwyn businesses have actively contributed as sponsors: Putterills, Neel Dentistry, Mimram Vets and Susu, along with many very generous individual benefactors. The Welwyn Wailers also gave a substantial donation from their 2016 ‘Wail’. The Community Heartbeat Trust will provide some training and the Parish Plan Action Group will advise about that when known. More details, including instructions in the use of the AED, will be issued on the WPAG website as soon as the AED is commisioned and ready for service. The Welwyn Parish Plan Action Group is well on the way to raising sufficient funds for a second AED for the civic parish of Welwyn and the project team will meet in early July 2016 to debate where it should be located. More about that when it is decided. The following was published on the OWL (Online Watch Link) system on 21st September 2015 for all Neighbourhood Watch members. We would like to say a huge thank you to all those who completed our survey on Hertfordshire’s Community DriveSafe scheme. It was completed by an overwhelming 1,288 of you, with many more comments sent by email. We were incredibly pleased to see that 74% of survey participants support the principle of the DriveSafe scheme, many sending positive comments about their experiences. However, it was also clear that some respondents are uncertain what DriveSafe is about and that more publicity and awareness is needed. If you’d like more information please visit the Police Commissioner’s site for details. Community DriveSafe is an important part of the Police and Crime Commissioner’s wider volunteering strategy empowering people and local businesses to support traffic speed reduction in their village or town. The aim is to educate drivers on the impact and dangers of their speed. The survey showed there is a perception by some that speed monitoring should not be carried out by volunteers. We would like to clarify that this scheme is about educating motorists and empowering local people; DriveSafe schemes are supported by police Safer Neighbourhood Teams and designed to complement speed enforcement carried out by officers. We also now have 27 Special Constables who support the schemes, using a laser speed gun at DriveSafe locations. Feedback from the survey will be used to inform future improvements of the DriveSafe Scheme. Two if the most popular suggestions were to extend the scheme to include drivers on mobile phones and illegal and unsafe parking. Both are in the Police and Crime plan around anti-social driving and will be taken forward over the coming months. Again, thank you to all who took the time to respond to the survey. (The following is a notice put out on 18th September 2015 by the Police Crime Commissioner to Neighbourhood Watch members on the OWL (Online Watch Link) system). Anyone involved in trade and commerce (whether a leader, employee or a special interest) is invited to feed back their views on the Police and Crime Commissioner’s new Business Crime Strategy for Hertfordshire. A consultation has begun on Commissioner David Lloyd’s new plan that sets out how business crime will be tackled. Crime against businesses currently makes up a fifth of all recorded crime and has a wider impact on the local economy as well as on individuals – financially, as well as emotionally. To ensure the Business Crime Strategy meets the needs of Hertfordshire, the Commissioner would appreciate feedback and comments on the draft plan – this will shape the final document and create a workable plan that tackles this crime. The consultation closes on 30th September 2015.